YUM! Today is Gooseberry Patch's Recipe Round up with Soups and Stews. Which are YOUR favorite recipes for Soup or Stew? 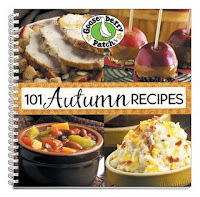 101 Autumn Recipes...don't forget this book is half off this week! Tori Willis from Champaign, Illinois shared her Aunt Carol's recipe. Aunt Carol was who taught her the grilled-cheese crouton trick...sounds SO tasty, doesn't it? In a stockpot over medium-low heat, simmer tomatoes and juice for 30 minutes. Purée tomato mixture and basil in a food processor; return to pot. Stir in remaining ingredients. Cook over low heat, stirring until butter is melted; do not boil. Garnish with Grilled Cheese Croutons. Serves 4. Combine butter and thyme; spread over one side of each bread slice. Place 3 slices in a skillet, buttered-side down. Top each with a cheese slice and a bread slice, buttered-side up. Cook over medium-high heat for 3 to 5 minutes per side, until toasted and golden. Cut into one-inch squares.